Let’s examine some key nutrients for a healthy pregnancy. 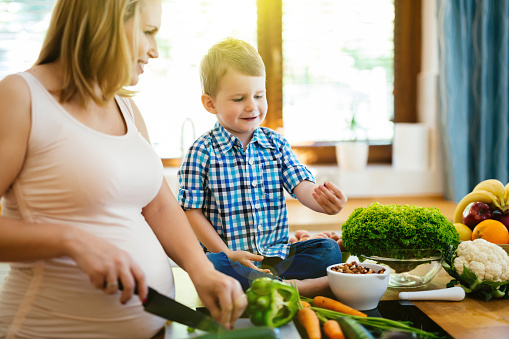 Important steps for a healthy pregnancy include enjoying a balanced diet, getting the right amount of exercise, and following any other recommendations by your doctor. A balanced eating plan with a variety of foods can provide healthy women with enough nutrients for pregnancy. Here are 3 key nutrients for a healthy pregnancy. This vitamin reduces the risk of birth defects that affect the spinal cord. Pregnant women need at least 400 micrograms of folic acid every day. Natural sources include legumes, citrus fruits and leafy green vegetables. You can also find it in fortified breads and cereals. Iron deficiency is the most common nutrient deficiency during pregnancy. Pregnant women need at least 27 milligrams of iron each day. Foods with iron include red meat, chicken, fish, fortified cereals, some leafy greens and beans. Combining plant-based sources of iron with vitamin-C rich foods increases iron absorption. For example, try iron-fortified cereal with strawberries or oranges. Calcium is required during pregnancy for the healthy development of a baby’s bones, teeth, muscle and nerves. Pregnant women ages 19 to 50 need at least 1,000 milligrams of calcium daily. Aim for 3 daily servings of low-fat or fat-free dairy, or calcium-fortified cereals, beverages or juices. Your doctor or registered dietitian nutritionist may recommend a prenatal vitamin/mineral supplement to ensure that you get enough iron, folic acid, calcium and other nutrients while pregnant. Always consult with your doctor before following any other recommendations. Schedule a free consultation with Dr. Karen Leibowitz at KareBoost Health to see how we can support you in your healthy pregnancy.